A high profile group of agricultural officials and veterinarians from China visited Stirling Agricultural Centre on Wednesday October 17th for a fact-finding visit about the Scottish auction market system and traceability systems. 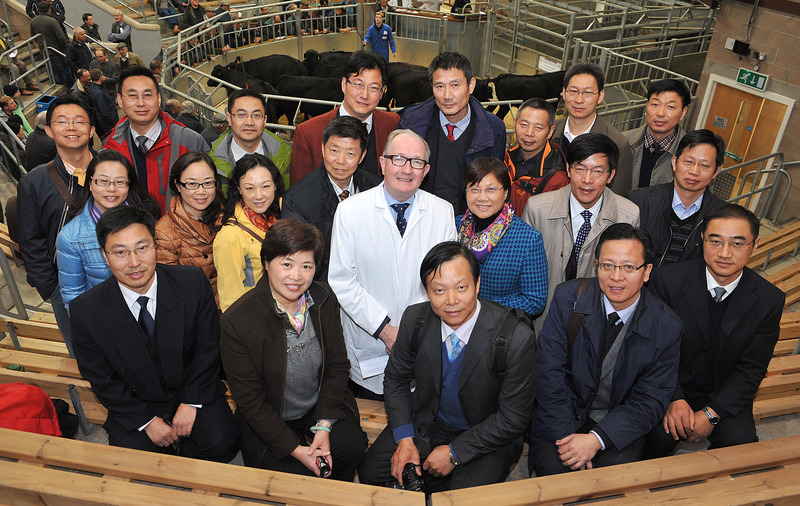 Led by Ms Wang Qiuxia (pictured right of David Leggat), Director of the Province of Jiangsu Inspection and Quarantine Bureau on the east coast of China, the 26 delegates spent 90 minutes with United Auctions’ (UA’s) Executive Chairman David Leggat, discussing – with the help of an interpreter -livestock marketing and traceability of livestock movement systems in Scotland. They also toured the mart during the Centre’s special sale of store and forward cattle, cast cows and sheep to see best practices in action. David Leggat, Executive Chairman of UA, said: “We were delighted to welcome such a high powered delegation. They were an extremely knowledgeable and interested group who were impressed by what they saw. The visit to Scotland’s leading livestock auctioneers was the group’s only engagement in Scotland. It followed a tour in York and the delegation left Stirling for their next scheduled stop in Wales.